A Time Signature consists of 2 figures in the form of a fraction, placed together at the beginning of every piece of music to fix the time of the rhythm of the music. Tempo is the speed or rate of a piece of music usually measured in beats per minute (bpm), whereas rhythm is the way in which the tempo is played - the division of musical ideas or sentences into metrical portions. It is the timing of musical sounds and silences. A Time Signature consists of an upper numeral and a lower numeral. The upper numeral indicates how many beats there are in a bar. The lower numeral indicates the note value which represents one beat. In a musical score, the time signature appears at the beginning of the piece, immediately following the key signature. This can be in the form of a time symbol such as C which represents cut time (2/2), or in the form of stacked numerals such as 4/4, 3/4, 6/8 etc. If the piece is in the key of C Major or A minor where there is no key signature (sharps or flats), the time signature is placed straight after the Clef sign. Sometimes you will see another time signature midway through a piece. This occurs when there is a change of rhythm or timing. When this occurs you will see the new time signature following a bar line. All the music shown after the new time signature will be played according to the new time. When a dot is placed after a note, the time of the note is increased by half again. Normally the accent would be on beats 1 and 3, and with syncopation, beats 2 and 4, e.g. reggae. But in this example, the syncopated beat lies beyond the normal beats in the bar... & of 4&. 4/4 : Common Time - Widely used in most forms of Western popular music. 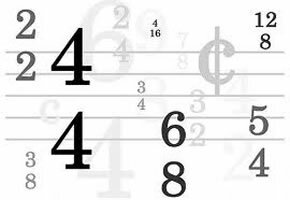 Most common time signature in rock, blues, country, folk, funk and pop including a wide variety of modern genres introduced over the last few decades. 2/2 : Cut Time or Alla Breve - commonly used in fast orchestral music and marches. You will also find it in musical theatre and some forms of popular music. 4/2 : Never found in early music and rare since 1600, although Brahms and other composers used it occasionally. 2/4 : Used for polkas and marches. 3/4 : Used for waltzes, minuets, scherzi, country & western ballads, and sometimes used in pop. 3/8 : Also used for the above, but usually suggests a faster tempo. 6/8: Polkas Double jigs, tarantella, sega, barcarolles, marches, loures, and some rock music. 9/8: Compound Triple Time - occurs rarely - used in triple or 'slip' jigs. 12/8: Commonly used in slow blues. It is also known as the doo-wup or shuffle. It is being used in some forms of rock music and you will hear it in some jigs... a popular example of this is The Irish Washerwoman.